In 1963, the new President of the University, John Lederle, had just arrived in Amherst from the University of Michigan. And he brought with him a vision that “a great university has to have a great band!” As it happens Joe Contino the director of bands at UMass stepped away from that position in the spring of 1963. Two weeks before band camp John Jenkins – with two music degrees from Michigan – was hired. John Jenkins’ early vision was to increase the size of the band – 55 at the time – and bring the ‘Michigan way’ to UMass. That he did, and more. It was in the spring of 1977 with a band that now numbered about 175, that Dr. Jenkins gave up the marching band to other university duties. 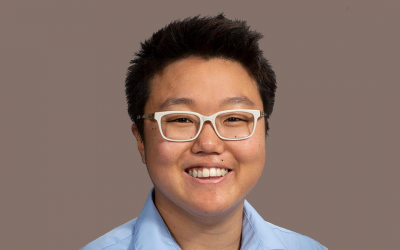 Dr. Jenkins went back to the Big 10 and found a 24-year-old just completing his master’s degree at Northwestern whom he thought could lead the UMass band into the future. Jenkins saw the future of marching bands and thought that George Parks would be the right person for the next chapter at UMass. To this day, John Jenkins says it was the single best decision he ever made! The experiences George Parks had at West Chester, along with Delaware (where Parks spent his first two undergraduate years), Northwestern, the Reading Buccaneers (a DCA Drum Corps where George Parks was drum major), and with numerous DCI drum corps, became the combined vision of what George Parks thought UMass could be. Going back to the vision. West Chester, it must be remembered, was in the top tier of marching bands both in size and quality back in the late 1970s. So, the UMass vision was oh say, sixty trumpets like West Chester, to be able to play and march with the kind of music that West Chester played such as “Godspell,” “Softly as I Leave You,” “Russian Christmas Music,” “My Way,” along with some of the big drum corps tunes of the day, “Let It Be Me” arranged by the great Jim Ott (Spirit of Atlanta), and Paul Lavender’s 1980 arrangement (slightly abridged for marching band) of the “Theme from Ice Castles” (Madison Scouts), to name a few. Mr. Parks was sure, or at least tried to convince anyone who would listen, that by his second year the UMass band would be up for playing a couple of these tunes. “My Way” was of particular interest. Or, maybe he wanted for UMass what he experienced at West Chester and the one sure way to gauge that is by playing the same music. Either way, there were those who weren’t so sure… Those who thought that UMass shouldn’t yet attempt these tunes… Don’t put the young band in a position of potential failure. Who might those have been? Well starting at the top, George Parks’ biggest supporter, his Mom! She was more than a bit nervous about the idea of playing “My Way.” This was a big deal. The West Chester band performed the heck out of it. And clearly it had special meaning to both of them. To be sure, Mrs. Parks made her way up to Amherst for most home games for the first 15 years or so. She wanted to be nervous in person. Mrs. Parks was there for a “My Way” performance in 1978! 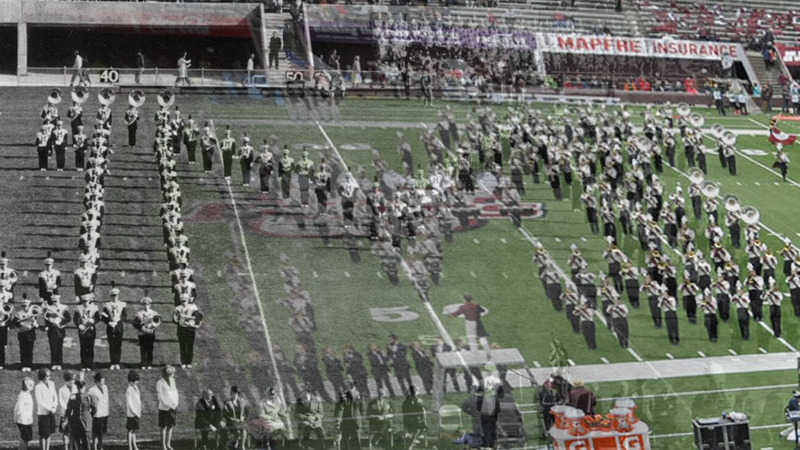 First, it’s important to remember that UMass was still doing at least four different field shows each year. So why not tackle some challenging material? So, before getting into “My Way,” a little bit of history. The UMass band gave its first exhibition performance at MICA, the Massachusetts Instrumental Conductors Association, in 1978. This organization hosts an annual marching band competition the UMMB has performed at each year since its inception. George Parks was asked to judge. He was doing overall effect, so was up in the press box. This becomes important, as you’ll see below. UMass, in addition to the above show, pulled out all the stops with their second show for that year’s MICA Finals. This was the very first arrangement of Malaqueña for UMass. In the late 70’s the term ‘silks’ was used to describe the flags. You’ll hear that in the announcement. Please listen closely to the very end of “Malaqueña,” right after the last note you will hear a big swish which is a recording of the ‘silks’ doing their final ‘slam’ (big flags with aluminum poles, it was a slam). Not sure there are very many audio recordings of color guard routines. So, another first. Most bands at that time, including UMass, didn’t march tris or quads, they really didn’t exist. They actually marched marimbas and glockenspiels, and sometimes tympanies on the sidelines. UMass changed that in 1978. The Hubbard brothers Duane and Dana were already trumpet players in the band. In 1978, the Hubbard twins Darryl and Dale joined the band and brought with them their marching ‘roto toms.’ The first marching ‘toms’ for UMass. They can be heard clearly in the live recording of “My Way” at MICA. While “My Way” was a big deal and big challenge for UMass, there was the small issue of “Festive Overture.” Sixty trumpets would have helped. UMass had 24. The big deal was that the best high school band in Massachusetts at the time, Norwood, was playing the same arrangement with a bigger band. Let’s just say, as would become the norm: challenge met and exceeded. This little bit somehow is not in the live recording, but just before UMass began the opening of the first show, from way above in the press box came the very loud scream from a certain UMass band director, “MAKE IT CRAZY!” That set the tone for the day, and of course those are words that have defined the UMMB forever. For those of you that ever knew George Parks and had the opportunity to play in one of his bands, this will not come as a surprise, but it surprised us a bit. The second piece of the first show, “Land of Make Believe” (oh yeah, the first Chuck Mangione piece of many) was being conducted by Mr. Parks. As the band completes “Meadowlands” one can see someone bounding down the stands of Cawley Stadium from the press box, hopping the small barrier, climbing the ladder in time to call the band to attention, and then calmly saying “good afternoon.” You can hear this on the recording. Of course, that hyped the band up, just a bit more. Not that they needed it. “We close our afternoon show with the beautiful strains of “My Way.” Band announcer Jim Coelho’s subtle introduction… And yes, as you will hear, it brought down the house. This is really where it all began. So, “My Way” and the UMass Band lived up to the hype. Suddenly people from all over the state, and more importantly high school students, were taking note of what was happening in Western Mass. But, there is much more to the “My Way” story. The next part of the story occurred during the postgame ‘band circle’ outside the stadium where the band would gather before being dismissed. Very often “Twilight Shadows” would be played before heading to the busses. “My Way” slowly replaced that. This was before the band started performing post game shows in the stadium. “My Way” was part of the standard band folder of music that everyone received at the beginning of the year. Mr. Parks began using the first part of “My Way” as a warm up tune, and as many conductors do, asked everyone to sing their parts for the second part of the tune (still the quiet part). By this time My Way was played just before dismissal after each game. At one rehearsal in September, the band librarians passed out the words to everyone in the band. And at that rehearsal, ‘sing your parts’ included the words for the first time. Thus, began the singing of “My Way.” Once the band started doing postgame shows, “My Way” became the last tune before the band broke for the day. In 1981, the band finally got new uniforms (the long red jackets worn until the 2001 Presidential Inauguration). In 1982 [listen], the last part of “My Way” was shortened up. By 1983 [listen], “My Way” was expected to be played after every show, especially by band alumni! In the 90’s one more change to “My Way” occurred when UMMB arranger Michael Klesch ’90 M.M., rearranged the last part [listen] to make it a bit cleaner and to really bring out that trombone part at the very end (Bali Hai! Thank you Heidi). This is the version that UMass plays today. The Homecoming 2010 postgame performance [watch] with 1,000 alumni mourning the death of George Parks is probably the most important and most meaningful “My Way” ever. 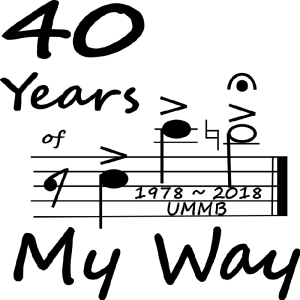 “My Way” is really the musical incarnation of the vision for the band and the band program. The vision continues to reveal itself and move ahead in so many ways: MICA 1978 and all the MICAs there after. Presidential Inaugurals, professional football games in both the US and Canada, parades throughout New England, record setting Band Days, standing ovations at Allentown and with the Delaware Band at Delaware Stadium and at UMass, the Boston Pops, the State House, Faneuil Hall, the Macy’s Parade, the Rose Parade, the Sudler Trophy! “My Way” belongs to all of us, those who’ve come after 1978 and all those who came before. 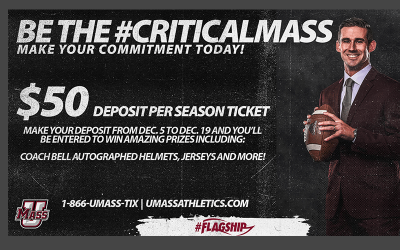 It’s the UMass way. Barry Pilson ’80 was a sophomore in the Minuteman Marching Band the year George Parks became director. He marched alto sax, and was in the guard in 1980. Editor’s Note: MICA changed its name in the 1990s to MICCA (the Massachusetts Instrumental and Choral Conductors Association). My husband and I, dad and step-mom were at the Multibands performance on Friday. The whole thing… Totally. Awesome! With Pride – no question. We traveled in from Monson, North Carolina and Oklahoma for this! Last time I was there was 2010 Homecoming and it felt like yesterday. OMG … thee ‘Tara Howard’ ??? – I was so surprised to see your name at the end of the comment. Seeing your name brought back some great memories. You were a wonderful student teacher. I was also at this year’s Multibands’ performance – wish I had gotten to see you. Just few quick correction to your story. The first field show in 1978 was “Star Wars”, not “Meadowlands”, which was the last performance of the year. After Star Wars came Russian Christmas Music, Neal Diamond, then Meadowlands. Second, “Shady” Grady had been playing the tri-toms since 1976. You are correct that in 1978 the Hubbard brothers brought the roto-toms. What was interesting about Star Wars was the night before, more than half the band went to see it at the Hadley cinema. As the opening screen rolled, you could here all the band members calling out their marching steps and mouthing there music. As for Meadowlands, it was performed on Senior Day, last home game. The reason why I remember it so well was the Tuba music had 128 measure repeat, same 5 notes, for land of make believe. About the Neal Diamond show, I brought the records to George and we spent two nights after the first away game at Harvard choosing the music to get orchestrated. He then sent it off before Russian Christmas Music practice. Had the music and charting 2 weeks later. Also, our first recording of My Way was in 1978, I still have my records from 1977 and 1978. Thanks for the response. Going to my inner Kierstead here, if you have the 1977 and 1978 records then you will note that in 1977 the shows were, in this order, Rocky, Star Wars, Beetles, Mahogany, Chorus Line. In 1978 in order, Meadowlands, Russian Christmas(both done at MICA). I mentioned of course that the first recording of My Way was on the 1978 live recording. The other shows that year, Diamond ’78 as you mentioned and the Pops show as the final show on a freezing cold November day. As for Shady, my memory slipped there, but not sure he always marched with those.